This one came as a what's app forward. Seems to have happened in Bangalore. 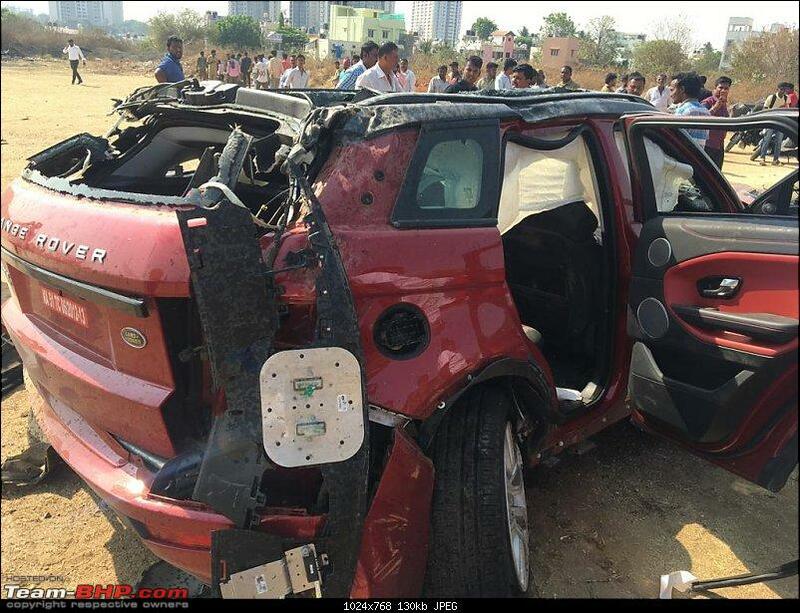 The Evoque is a test drive vehicle and was being driven at very high speeds before crashing. 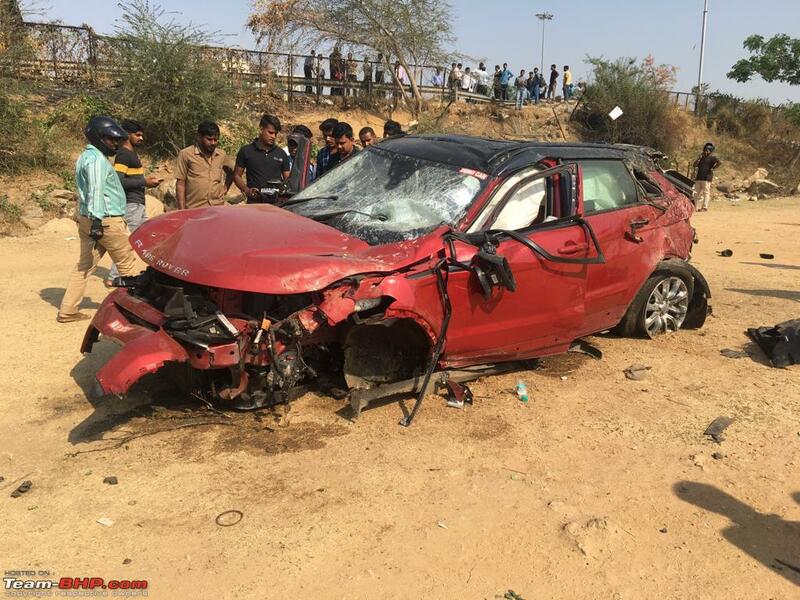 The customer who's driving the car was instantly killed where as the SA escaped with minor injuries. 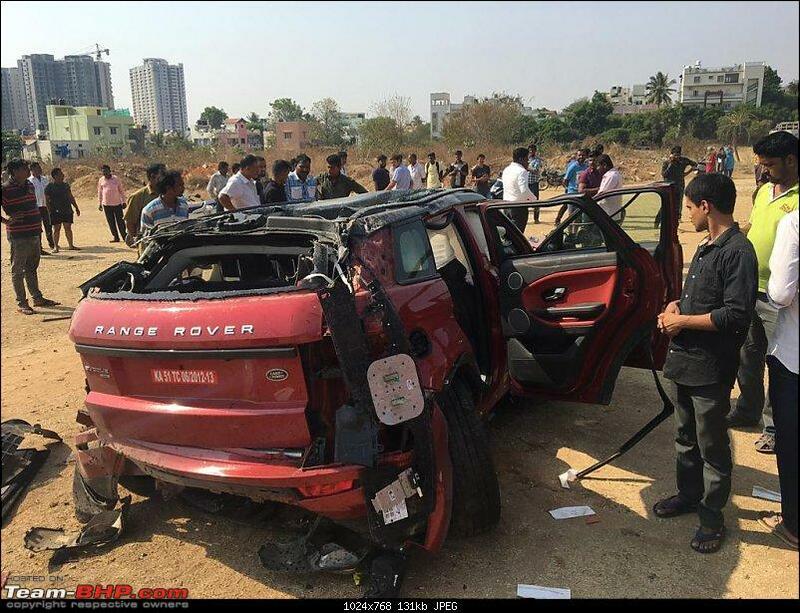 I am sorry, where can you drive at so fast in Bangalore? However a lot of TD vehicles are driven rashly. However a lot of TD vehicles are driven rashly. NICE Road where you can drive at insane speeds and crash like this! We have company buses do 120 on an everyday basis here. So the RR doing those speeds especially on the concrete stretch is quite imaginable. This is the sad part of this road that gets abused very badly. Did this happen there? That is the only spot, where you can come close. However 120 and 190 are very different speeds. Till about 120 and 130 the needle goes there fairly easily on a good road with sparse traffic but that much higher? It is quite a stretch. Most likely the guy would be doing 140-150 max and then had an accident. However the speed itself is irrelevant here. Yes. As per a BHPian Sandsun7 who sent a pic, this happened at PES college exit of NICE Road. However 120 and 190 are very different speeds. Hence I gave an example of buses doing 120 and not cars. Check out YouTube videos and you will see so many examples of cars driven to their max speeds here!! Most likely the guy would be doing 140-150 max and then had an accident. However the speed itself is irrelevant here. Glad you share the same thoughts! The position of the stuck speedo needle at the time of accident is no basis to confirm the speeds during the accident just like blaming tire bursts when a car jumps the median. I was only trying to say that this is one road that is abused quite badly with insane speeds. The road design itself is very bad in the first place and then the traffic on a regular day. Why on earth did the SA let him drive in such speeds. And passenger side looks more damaged, not sure how he escaped with only minor injuries. Looks like the car was airborne, flipped, rolled and came to rest. No wonder it happened at that notorious PES exit. This is true and there is absolutely no road discipline these days on NICE road. Until few years back there was some discipline followed by the drivers with giving proper indication while changing lanes, keeping right lane for high speeds etc. These days it is horrible with people changing lanes as they wish without watching the traffic behind, squeeze in through the left most bike lanes and bikers zig zags onto the fast lane and what not. As the SA and customer build a rapport, the SA has no other choice but to be a sycophant and pander towards the customer's curiosity to over-speed, check its handling, comfort at high speeds etc. 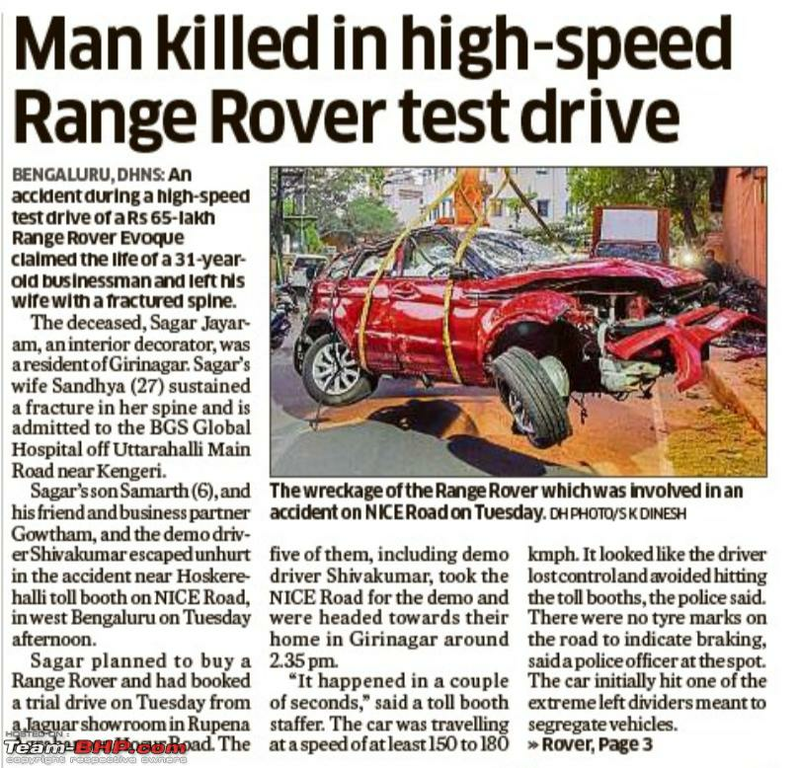 This is obviously, very very dangerous, I've seen many test-drive vehicles getting into accidents, and the showroom cannot gauge the driver's skill or ability until after getting into the vehicle - a perfect recipe for risk. To prevent this, ALL showrooms must make a TD-taker sign a piece of paper with instructions which should also be narrated/translated by the SA accordingly, and the instructions should be - 1) Obey all traffic laws as you would as a car owner 2) Stick to nationally defined legal speeds i.e 80 within city limits and 120 on highways 3) No rash/dangerous driving and 4) When found in violation of the above points, the SA reserves the right to stop the test-drive and drive the vehicle himself back to the dealership. This may be ever so slightly detrimental for a successful sale to take place, but over time all the customers will comply. An accident will result in much worse things. Last edited by dark.knight : 26th March 2019 at 21:36. Good grief... we may have some nightmare stories about car salespeople, but this is a grim reminder of how much more of a nightmare a customer can be to the salesman. Really, I feel for that guy. 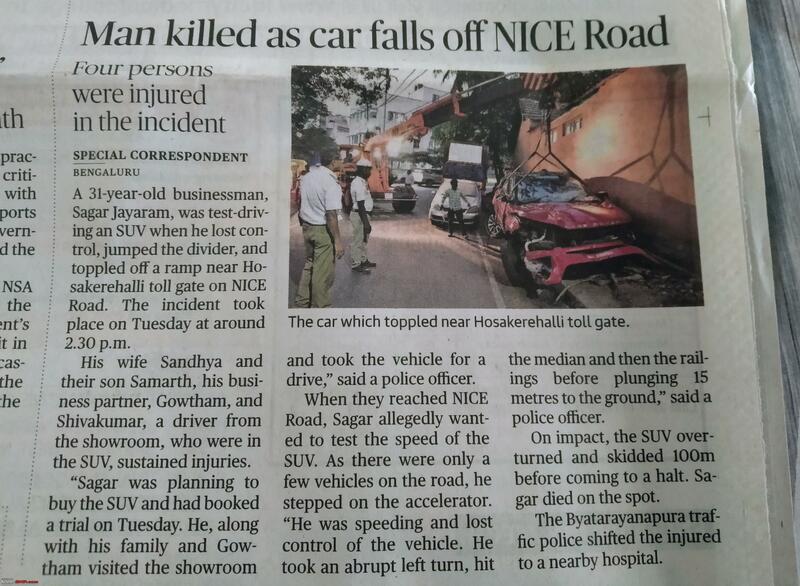 I guess the driver floored the pedal, and there was nothing the salesman could do to stop him. He must have felt helpless and terrified. Really hope he will get over his physical and mental injuries soon. 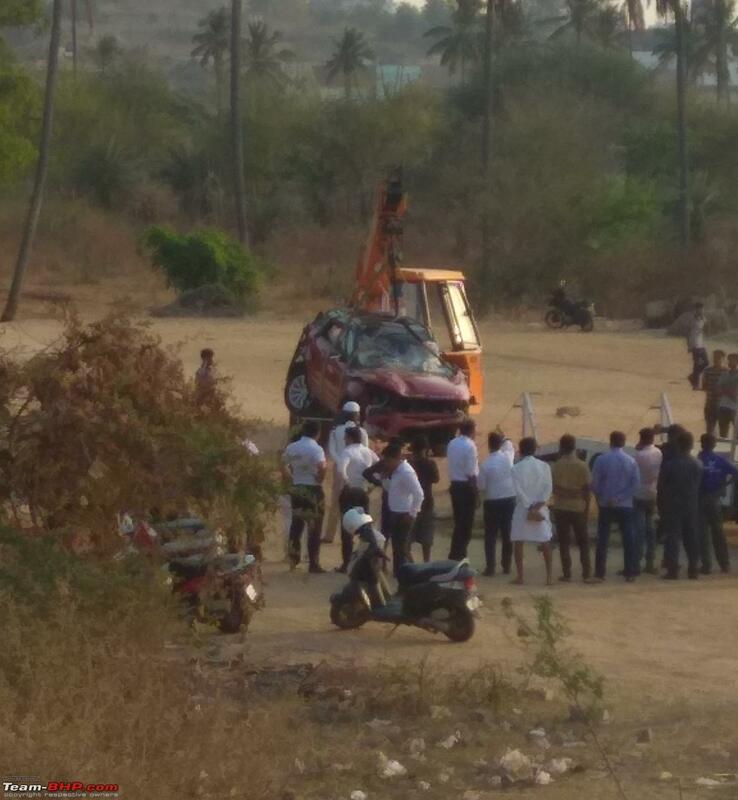 As to the loss of the driver: his genes will not be missed. But I hope he does not already have family and dependents. The road is not built to any standard. The surface is pathetic, no proper guard rails. If someone actually compared the road specification to the India Road Congress specification, I would put my money on that it would not conform. As the SA and customer build a rapport, the SA has no other choice but to be a sycophant and pander towards the customer's curiosity to over-speed, check its handling, comfort at high speeds etc. One stupid metaphor is that the Customer is King. Sorry but the customer is a killer. Disclaimers are rarely enforceable. Marqland will no doubt slap a case on the driver (I hope they noted his licence or they only have the poor deceased details!). In any case, the spouse might have to bear the liability if there is a case against the estate of the deceased. And passenger side looks more damaged, not sure how he escaped with only minor injuries. Maybe SA was the only one with seatbelts on. Also, the concept of more expensive the car is, the more faster it has to be driven is ingrained in our society. Even my own friends and relatives have pointed out BMWs and Audis being driven within speed limits and have wondered why they are driving slow and getting overtaken by Swifts and i10s driven at 130-140kmph. Last edited by Yieldway17 : 27th March 2019 at 00:05. Related Video with more images from the Range Rover Crash. 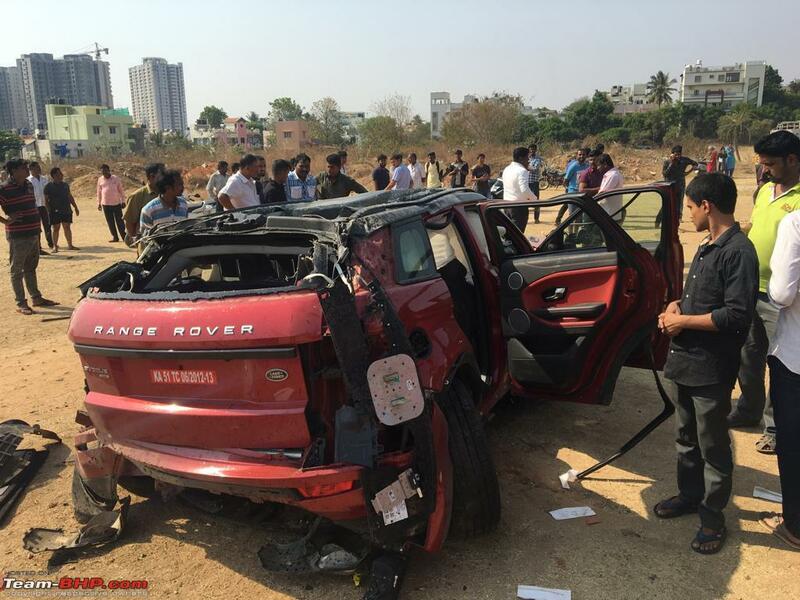 From few pictures it is evident that the RR has hit the booth lane divider and then crashed out of the fencing and landed where it is. The PES Exit booth at the end of Link Road is located after a super long gradient, quite dangerously. For anyone with a combination of adrenaline rush and absence of common sense, it's very easy to remain oblivious on how fast you are approaching the toll booth and then you brake or panic or run loose trying to find a lane with less cars in queue or even one with no barricade (half the lanes here are usually barricaded and you realise this only when you are very close to the booth) and then you crash. As keyboard experts we can speculate what may have happened in 100 different ways but those who take this route on an everyday basis will know about the obvious dangers I am referring to with the location of this booth, the speeds you can attain and the way you can go out of control!! Yes, the PES exit has a quite a downhill gradient just before the toll exit where some very high speeds can be achieved. 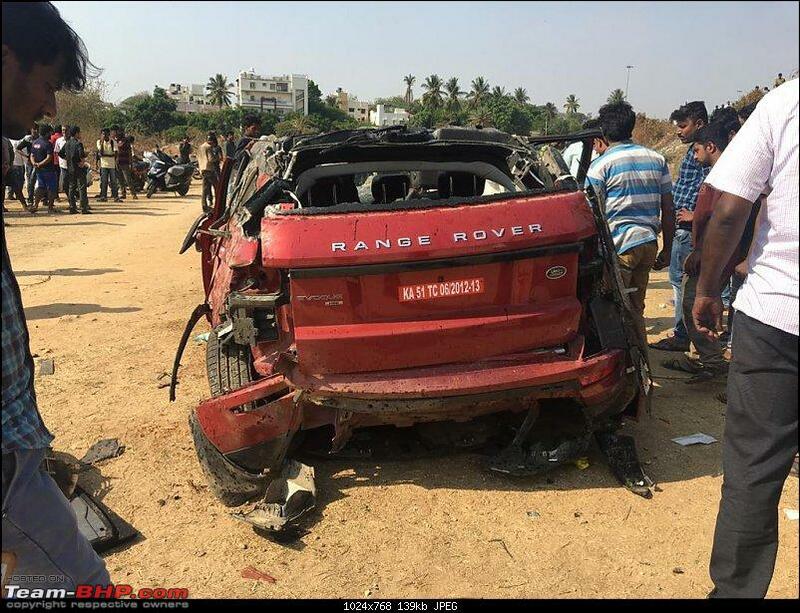 An overzealous customer in an high end car capable of achieving such high speeds is a recipe for disaster. News article about this accident. As to the loss of the passenger: his genes will not be missed. But I hope he does not already have family and dependents. Sadly he has a wife and kid who were in the car as well who escaped. The wife suffered a broken spine. 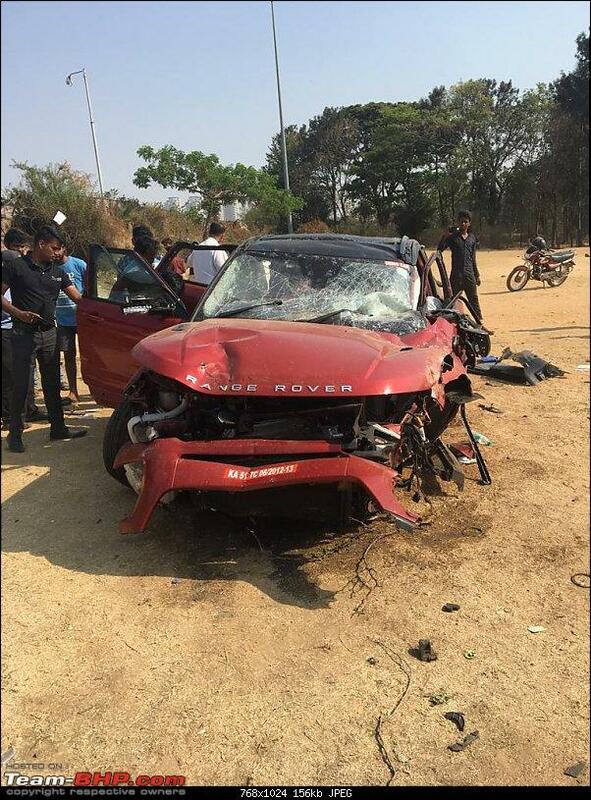 An accident during a high-speed test drive of a Rs 65-lakh Range Rover Evoque claimed the life of a 31-year-old businessman and left his wife with a fractured spine. 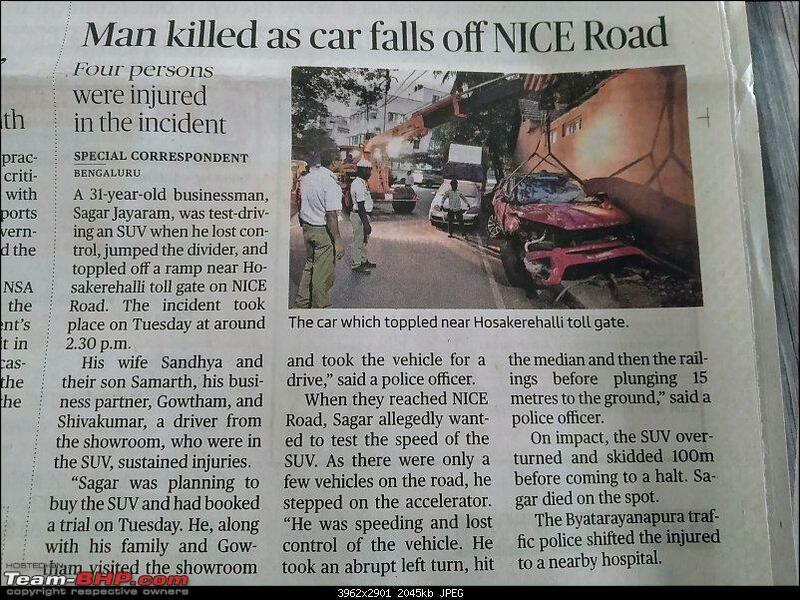 The deceased, Sagar Jayaram, an interior decorator, was a resident of Girinagar. Sagar’s wife Sandhya (27) sustained a fracture in her spine and is admitted to the BGS Global Hospital off Uttarahalli Main Road near Kengeri. 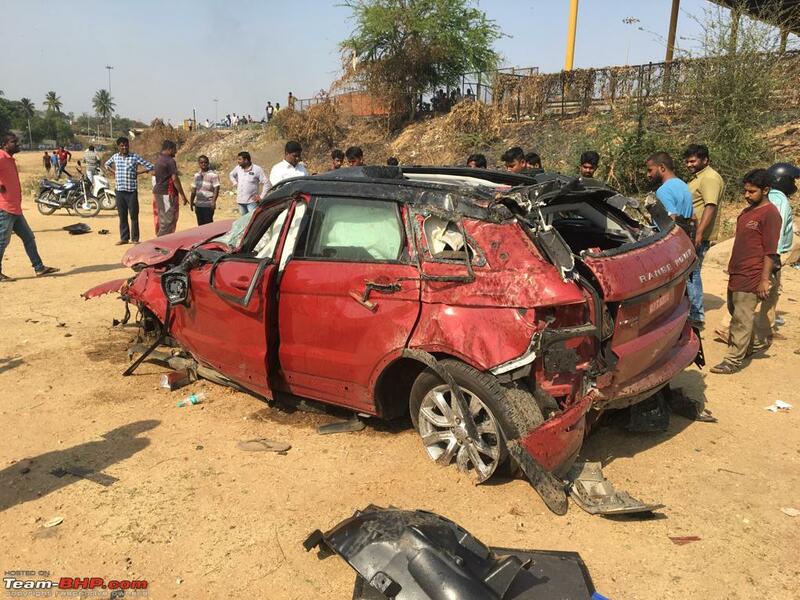 Sagar’s son Samarth (6),and his friend and business partner Gowtham, and the demo driver Shivakumar escaped unhurt in the accident near Hoskerehalli toll booth on NICE Road, in west Bengaluru on Tuesday afternoon. 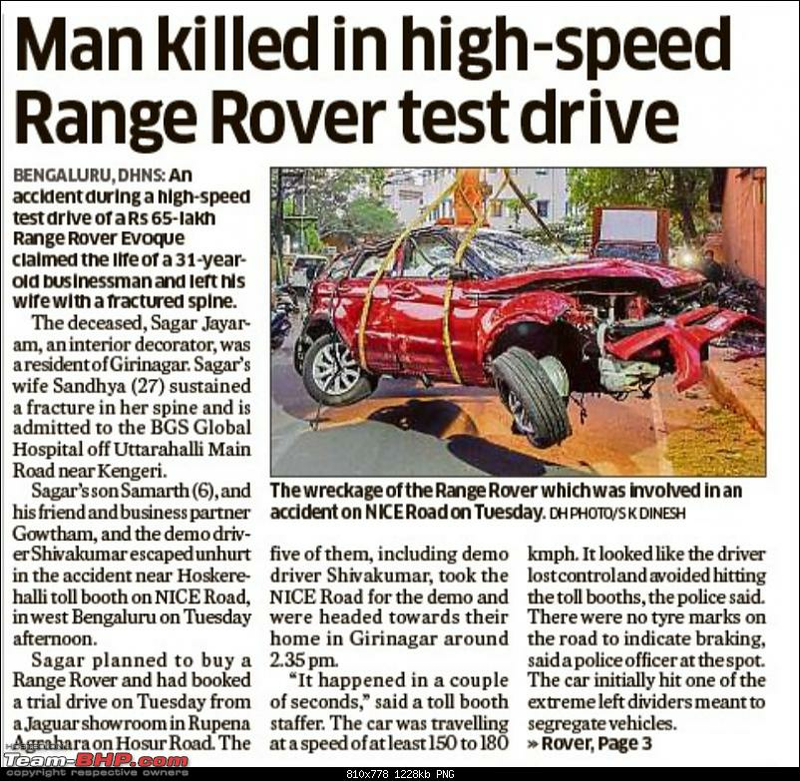 Sagar planned to buy a Range Rover and had booked a trial drive on Tuesday from a Jaguar showroom in Rupena Agrahara on Hosur Road. 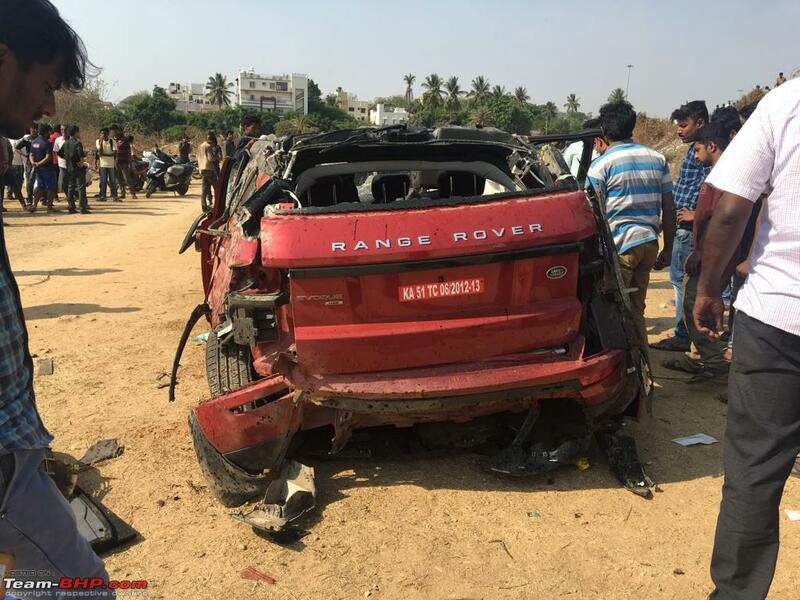 The five of them, including demo driver Shivakumar, took the NICE Road for the demo and were headed towards their home in Girinagar around 2.35 pm. "It happened in a couple of seconds,” said a toll booth staffer. 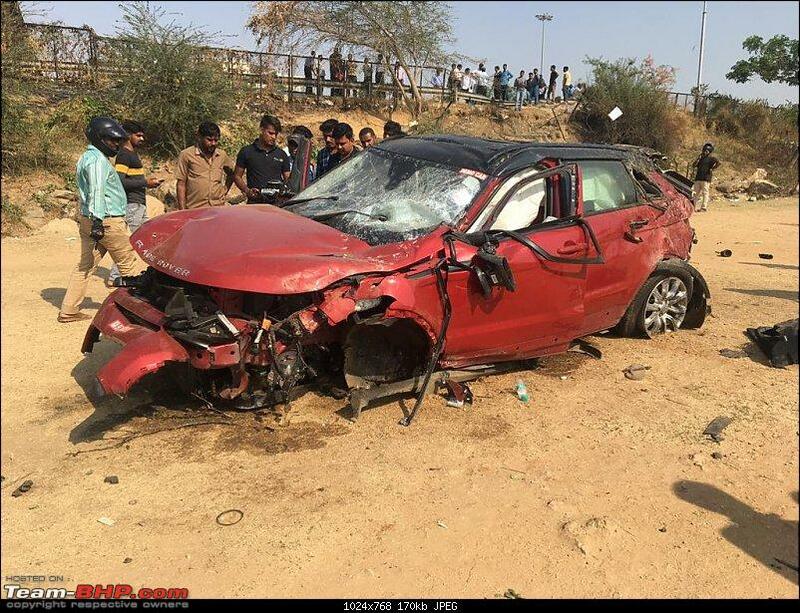 The car was travelling at a speed of at least 150 to 180 kmph. It looked like the driver lost control and avoided hitting the toll booths, the police said. There were no tyre marks on the road to indicate braking, said a police officer at the spot. The car initially hit one of the extreme left dividers meant to segregate vehicles. It then hit the guard rails, and ploughed through a fence and fell 10 to 12 metres down an embankment. The toll booth staff and other motorists rushed to the victims’ help and tried to extricate them from the car fearing it could catch fire. Police rushed to the spot and shifted the victims to BGS Global Hospital. 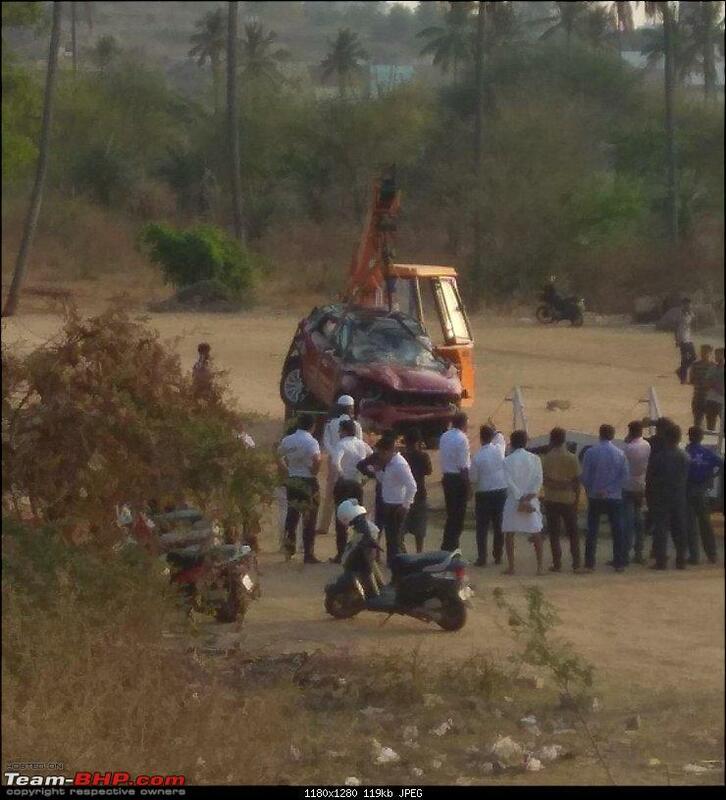 Prima facie it looks like Sagar was driving the car with the demo driver Shivakumar in the passenger’s seat. 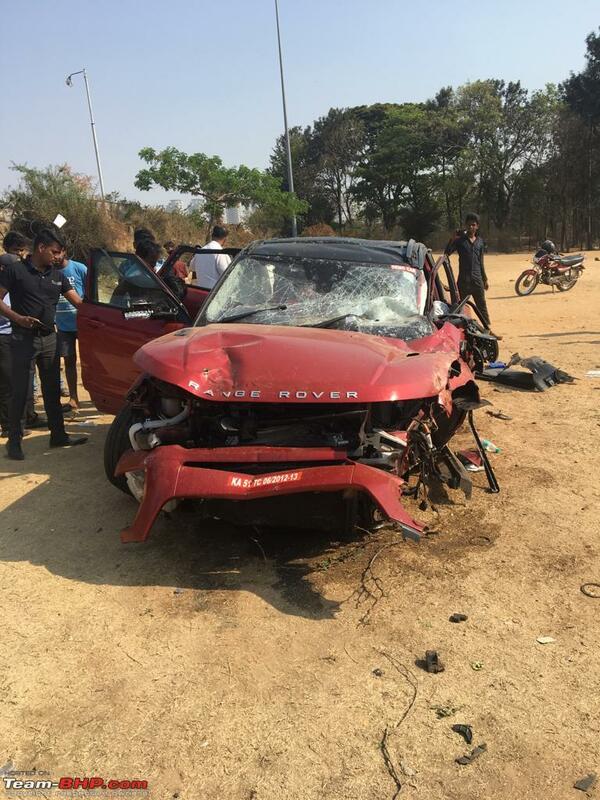 The car flipped over several times and Sagar was found bleeding from his face and ears. The driver and the co-passenger were wearing seat belts and the air-bags deployed. Sagar was declared brought dead at the hospital after which his body was shifted to Victoria Hospital for postmortem.